TUCSON, Ariz. — Ex-Texas A&M quarterback Kyle Allen threw for 225 yards and a touchdown but was intercepted twice in his first game for Houston and the Cougars had to hold on to beat Arizona 19-16 in their week-delayed season opener on Saturday night. Houston (1-0) gave Major Applewhite a victory in his head coaching debut a week after the scheduled opener at UTSA was canceled due to Hurricane Harvey. John Leday’s 81-yard kickoff return set up Houston’s go-ahead touchdown with 45 seconds left in the first half. Josh Pollack kicked three field goals for Arizona (1-1), the last, from 42, yards cut the lead to 19-16 with 8:32 to play. Khalil Tate replaced Arizona quarterback Brandon Dawkins early in the fourth quarter and the Wildcats were at the Houston 32 when Garrett Davis’ interception with 3:49 remaining preserved the win. Dawkins, who returned for the final three minutes, fumbled the ball away twice, one for a safety, in the second half. Allen, one of the nation’s top recruits from suburban Phoenix in 2013, started 14 games and played in 20 for Texas A&M before transferring to Houston. He sat out last season as a redshirt. He said he didn’t find out until Saturday that he would start. Allen, who completed 25 of 32 passes, threw 49 yards to Keith Corbin to set up his first TD pass as a Cougar, five yards to Linell Bonner to put Houston up 10-3 with five minutes left in the half. Arizona, helped by a pass interference penalty in the end zone, tied it 10-10 on Zach Green’s 1-yard run 2:22 before halftime. Leday took the subsequent kickoff and the last man who had a chance to stop him, Kwesi Mashack, tackled him at the Wildcats 16. Dillon Birden’s 3-yard touchdown run with 45 seconds gave Houston its 17-10 halftime lead. Houston: Allen showed he has the talent to take over the Cougars’ offense but he made some poor decisions and this Houston team looks a long way from the high-scoring squads of the recent past. Arizona: The young Wildcats went toe-to-toe with the Cougars all night, especially on defense, but mistakes and a few big Houston plays doomed them. Houston: The Cougars play their home opener next Saturday against Rice. 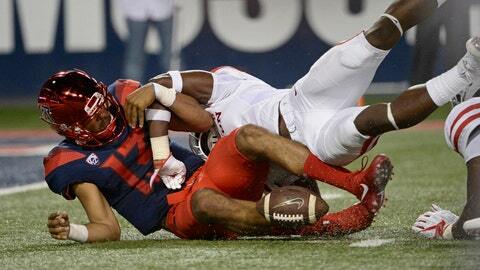 Arizona: The Wildcats play their first road game at UTEP next Saturday.